SURPRISE! Valor of the Healer and Vengeance of the Hunter sale! 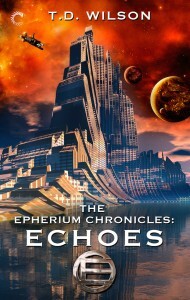 Found out today that the first two books of the Rebels of Adalonia trilogy are on SALE. Valor of the Healer has been punted down to 99 cents, and Vengeance of the Hunter is currently selling at $1.24 (or at least on iBooks, $1.99). These prices are showing up on all major ebook vendors, AND on CarinaPress.com itself. EDITING TO ADD: Valor and Vengeance are both still on sale, but as of 4/8 the sale price for each is $1.49 on major ebook vendors. On Carina Press’s own site, however, the 99 cents price still applies for Valor, and the $1.24 price still applies for Vengeance. EDITING TO ADD 6/1/2016: The prices have been adjusted again! Valor of the Healer is currently selling for $1.49, and Vengeance is selling for $2.49. So not as big of a sale, but still a sale compared to the usual $2.99 price point! So right now you can read the entire trilogy for just over about five bucks on your favorite ereader! Snap it up fast if you haven’t already, because I will not be informed how long these prices will last. And do spread the word, won’t you? Here’s a roundup of all the major places you can buy these books! And as always, do remember that the Rebels of Adalonia novels are not standalones, so you need to read all three to get the entire story. The reading order is Valor of the Healer, Vengeance of the Hunter, Victory of the Hawk. ETA: Where should you buy the book? I get slightly more money if you buy directly from Carina, but really, you should buy from wherever you find it easiest. If that means one of the other ebook vendors, go for it! 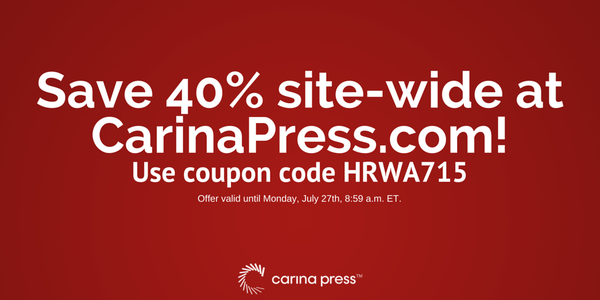 Everyone, TODAY ONLY (that’s December 23rd), Carina Press is running a site-wide coupon code for 50% off everything in their book catalog. The code is DAY2315! And remember, these books are not standalone novels, so you need to read all three to get the complete story. Reading order is Valor, Vengeance, Victory. And! Since the coupon code applies to everything in Carina’s catalog, if you see anything else up there that looks appealing, go ahead and stock up! I’ve mentioned fellow Carina author Susanna Fraser to y’all before–and I have indeed featured her before right here on Boosting the Signal. I’m delighted to have her back for her latest release with Carina, a romance novella just in time for the holidays. If Christmas-themed romances are your cup of spicy, aromatic tea, then you really can’t go wrong with a Fraser. A Christmas Reunion is the story of star-crossed lovers reunited at Christmas just a week before the heroine is set to marry another man. For today’s post, Susanna’s stepping into the point-of-view of that other man—the perfectly wealthy, charming, and suitable Sir Anthony Colville. I need a wife. Whether or not I want one hardly matters. Other gentlemen have the luxury of delay, or even of never wedding at all should true love fail to enter their lives or if the thought of a settled existence does not appeal. Those gentlemen either lack entailed property or have trustworthy heirs for it already, brothers or nephews or cousins who will take good care of their lands and dependents should it come to that. I am not so fortunate. The cousin who would inherit Colville House, and with it responsibility for the health and well-being of my tenants, my lands, and my mother and sisters, is a rogue and a wastrel of the first order. Every day that I go without fathering a healthy, legitimate son and heir and, ideally, an equally healthy younger brother for him, is a day everything my grandfather, my father, and I have worked for decades to build remains at risk of utter ruin. Lady Catherine Trevilian seemed an answer to my every prayer. She is a clever and self-possessed young lady of excellent birth, ideally suited by both family connections and inclination to be a great political hostess as well as the mistress and patroness of my estate. No, I am not passionately in love with her, but nor is she with me, so there is no imbalance there. We are friends, we can talk for hours, we can make each other laugh, and until today I was confident we would be happier together than ninety out of a hundred married couples in Society. But today I saw her with Captain Gabriel Shepherd, the baseborn and penniless poor relation of the family who became Catherine’s guardians after her father’s demise. They had not seen each other in five years, the good captain having been driven into the army after the two of them were caught kissing under the mistletoe, if you please! I would happily regard this as a mere youthful indiscretion—after all, who of us hasn’t experienced desperate calf love at sixteen or eighteen or twenty?—except that neither of them can tear their eyes from the other for any length of time, and last night I saw them passionately kissing on the staircase. I would never wish for Catherine to be unhappy. By any logical measure I would be a better husband for her than Captain Shepherd. Who knows if that grand Romeo-and-Juliet passion of theirs would last if she actually married him and had to live an everyday life with a man so far beneath her in birth and fortune? With me she would always have safety, stability, and a secure place in the world she was born into. Yet I will never be able to offer her that passion, that wild intensity of feeling. And now that she’s tasted it again—and as a woman grown, no longer a girl barely out of the schoolroom—will she truly be content without it? Still, I need a wife most desperately. I wish I knew the right path to follow.